It has roomy, comfy and quiet keys, a smooth and substantial mouse, and dedicated media buttons. While it’s missing the bells and whistles you’ll find in pricier, more recent keyboards, the Logitech MK520 wireless keyboard and mouse combo nails the basics for a wallet-friendly price. Boasting a palm rest, dedicated media buttons and more than a dozen programmable keys, the MK520’s keys feel smooth and responsive. The bundled mouse comes with plenty of heft and a customizable middle button. Listed at $60 but available on Amazon for half that, the MK520’s aging software and iffy Mac support are its only notable drawbacks. Measuring 17.8 x 7.5 x 0.9 inches and weighing about 1.75 pounds, the Logitech MK520 feels both comfy and roomy. It comes complete with a dedicated numeric keypad, a plastic (non-padded, unfortunately) palm rest, and a pair of retractable single-step feet that tilt the keyboard at an 8-degree angle. The MK520 boasts a total of 15 hotkeys for a variety of functions, ranging from Home and Mail to Application Switcher and Lock PC. You can reprogram these hotkeys using Logitech’s aging, clunky but still serviceable SetPoint utility. 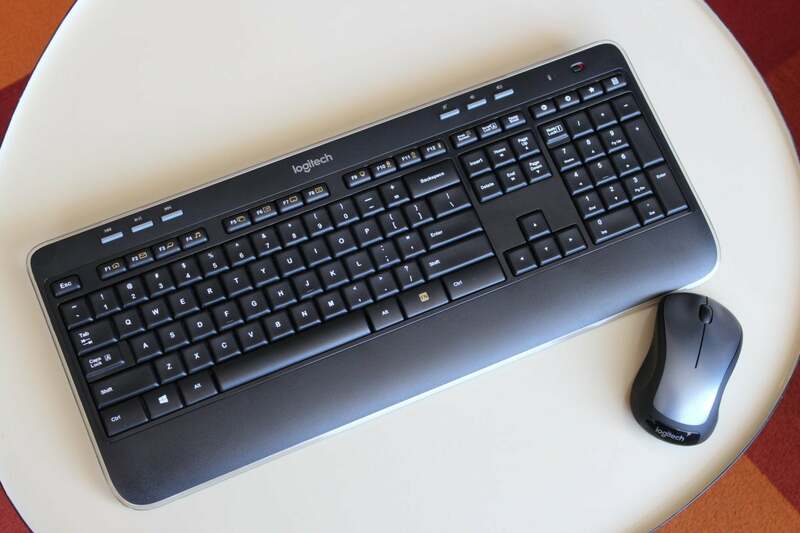 (To use the company’s more modern keyboard tool, Logitech Options, you’ll need to upgrade to the slightly pricier MK540.) For example, you can set a specific hotkey to open a webpage, a program, a folder or a file, or you can assign a custom keystroke. Also nice: the dedicated media playback and volume buttons that flank the Logitech logo above the main keyboard. Both the MK520 keyboard and its accompanying mouse connect to your PC using a single 2.4GHz USB dongle. I didn’t need to install any drivers to start typing or mousing with the MK520 combo; I just plugged the dongle into my PC’s USB port and everything worked. I never had any trouble with wireless connectivity or interference during my testing, and both the keyboard and mouse reconnected almost instantly after going to sleep following brief periods of inactivity. Designed to work primarily with Windows PCs, the MK520 will also connect to Mac systems, although you won’t be able to customize any of the hotkeys if you do so. The MK520’s broad, slightly concave keys are smooth, comfortable and relatively quiet. They boast a satisfying bump and springy rebound when struck. While I generally prefer clicky keyboards to bumpy ones, I was pretty happy with the snappy, tactile bumps on the MK520’s membrane-style keys. As with the MK540, a more recent version of this keyboard, the MK520’s keys manage to stay reasonably quiet without feeling squishy. The sculpted design of the keys combined with the keyboard’s overall roominess makes for easy discovery. The Logitech MK520 comes with the same bundled mouse as the newer MK550 keyboard, and that’s a good thing. The 3.5-ounce MK310 wireless mouse feels smooth and substantial, with a rubberized, ambidextrous grip that felt great in my hand. Unlike the MK520 keyboard, the included MK310 mouse is compatible with the sleek Logitech Options app, meaning you can reprogram the middle button with a wide variety of functions, including a handy “gesture control” mode that let you perform dozens of tasks by scrolling up, down, left or right. The Logitech MK520 keyboard and mouse combo boasts roomy, comfy and quiet keys, a smooth and substantial mouse, and dedicated media buttons. It’s also affordable, easy to set up, and highly customizable. It’s a shame the keyboard isn’t compatible with Logitech’s latest software utility. Affordable, easy to set up and offering plenty of customization options, the Logitech MK520 keyboard and mouse combo boasts roomy, comfy and quiet keys, a smooth and substantial mouse, and dedicated media buttons, although it’s a shame the keyboard isn’t compatible with Logitech’s latest software utility.